Made in Rocky Patel's boutique factory TaviCusa in Esteli, Nicaragua, the Sun Grown Maduro is triple-capped, hand-bunched, hand-rolled, and trunk-pressed for a perfect draw and burn. 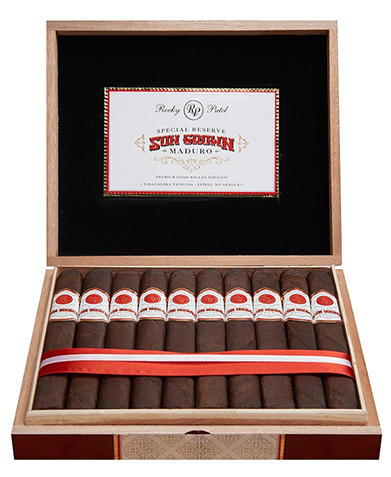 Blended with Nicaraguan filler and binder tobaccos wrapped in dark and decadent Connecticut Broadleaf, the Sun Grown Maduro is a medium-strength, medium- to full-bodied cigar with tremendous complexity and flavor. Earthiness and nuttiness intertwine with bittersweet chocolate and sweeter notes of caramel, cocoa, and cream, while pepper and spice make their presence known at just the right moments. It's no surprise the Rocky Patel Sun Grown Maduro cigar has received so many accolades and high ratings, including landing Cigar Aficionado's No. 2 spot in its Top 25 Cigars of 2016.